When considering a siding repair, homeowners often assume (or are led to believe) that all of their siding must be replaced. Learn how to get an inexpensive siding repair at a fraction of the price of an entire siding job. 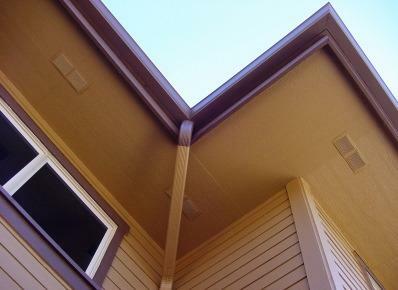 Prompt siding soffit repair can prevent further damage to the roof system. A quick patch can lessen home repair costs as long as the cause is detected and eliminated before repairs are made. Neglected soffits can be a haven for small animals, insects, and rot that can create problems in the overall structure of the house. Before starting a siding soffit repair, it is important to identify and rectify what caused the damage to the soffit. Rot: Wet rot is unusual to find on a properly protected soffit. However, dry rot and degradation caused by fungi, can be a problem for wood soffits. To treat this problem the affected wood must be removed and the surrounding areas painted with a fungi killing sealant. Insect Damage: Insect damage should be treated by an exterminator before any repairs are attempted. Once again, removal of the affected wood and treatment for the surrounding areas is essential to prevent further damage.